A smoke control solution from SE Controls is helping keep visitors, staff and event participants safe at Qatar’s Lusail Multipurpose Hall, by ensuring escape routes are kept free from smoke in the event of a fire. 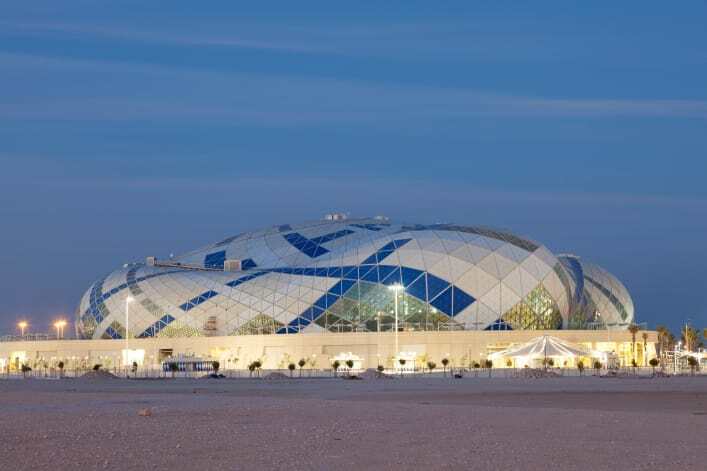 Designed by architects, Dar Al Handasah Consultants, the hall is located in a 133,000 sq.metre landscaped site in Lusail, Qatar and incorporates several arenas with a seating capacity of 20,000 and is capable of hosting key sports and entertainment events, such as basketball, volleyball and handball. The hall’s distinctive ‘conch shell’ design also incorporates training courts with warm-up areas and changing rooms for four teams, as well as VIP facilities; corporate entertainment boxes and retail stores with a comprehensive selection of food and drink outlets. As a key part of the venue’s extensive fire safety and protection systems, the SE Controls smoke ventilation system utilises 1,536 TGLA linear actuators of numerous different sizes, which automatically open the triangular vents in the building’s complex curved diagrid structure to ensure escape routes are kept clear of smoke if a fire should occur. The operation of the actuators is controlled by 96 individual OS2 SHEVTEC 30 Amp control panels, which are integrated into the building’s fire detection and alarm system. When a fire is detected, the OS2 panels automatically cause the linear actuators to open the smoke and heat exhaust vents, as well as triggering a fresh air inlet to open, via the building management system (BMS) to enable smoke to escape. Installed with the help of SE Controls system design and product supply partner in the Middle East, the complete natural smoke ventilation system also includes a battery back up to ensure failsafe operation even in the event of mains power failure. The Lusail Hall is the Middle-East’s largest and most spectator-friendly venue and is also one of the most sustainable structures having recently been awarded the prestigious 4 GSAS stars for employing eco-friendly construction and sustainability techniques.